Last week, I posted a look at rising home births in the US and discussed how the fact that the majority of the increase is attributed to white, wealthy, educated women is evidence of a problem. I don't think that it's in and of itself a problem that primarily privileged women are having home births, but I do think that it can point to a problem in the way birth options are discussed. Women with less privilege may not have access to the same resources that make a home birth a realistic option. But--and more importantly to my argument--these statistics may also point to the fact that the conversations surrounding birthing options are being dominated by privileged voices, and I'm concerned about what that means for the birthing experiences of those with less privilege. Inevitably, Amy Tuteur--a notorious internet presence who appears in the comments of virtually every online conversation about birthing options to demonize any woman who chooses a home birth as ill-informed, dangerous, and selfish--showed up to challenge my view. She left a comment on the post, and then today she referenced my post on her own blog where she claims it as evidence that home birth advocates are suggesting "it is the white woman's task to teach her unfortunate sisters of color how they ought to give birth." She first paints a gross misconstruction of my main point--which was never that less privileged women should be emulating those with more privilege, in fact, my point was and is that hearing from all women is important to taking the birth debate away from polarized language and into a productive space. But that's not even what frustrates me most. What frustrates me most is that her metaphor to illustrate how misguided I am actually dovetails quite nicely into my actual point. Homebirth is like following Martha Stewart. It's delightful to bake your own bread when you know that you don't HAVE to bake your own bread if you don't feel like it. Similarly, it seems delightful to privileged white women to avoid the hospital when they know that they don't HAVE to avoid the hospital if they change their mind. For other women, who don't have routine access to high quality medical care, who have medical risk factors, whose home is not a domestic paradise, who have enough unmedicated pain in their own lives that setting themselves the "goal" of enduring more pain without medication is unfathomable, homebirth is an affectation they have no interest in emulating. And--I'm as surprised by this as you are--I actually agree with some of that. Home birth (as it is currently discussed and rhetorically constructed in American culture) is a lot like following Martha Stewart. That's because home birth (and this was my entire point to begin with) has become (mostly) a--well--privilege for privileged women. Let's look at this bread metaphor a little more closely. 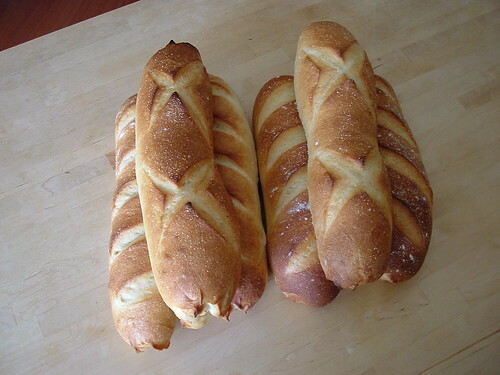 I believe that many people find pleasure in the aesthetic of bread making. The time that it takes to make the bread, the aroma of it baking, the physical act of putting together the ingredients are all part of that appeal. To me, this has some parallels with the home birth advocacy that focuses on the beauty of labor. Many women say that going through the labor process without medication or interventions is an amazingly spiritual and empowering experience. But those are not the only reasons people bake their own bread. People also bake their own bread out of concerns for their health. As this post points out, a lot of packaged bread contains ingredients that have either been deemed unhealthy or are questionable. And with reports coming out that sugar is toxic and some researchers are recommending it be regulated like tobacco and alcohol, those questionable ingredients are important. So some people make the decision to bake their own bread because they think it's the healthiest choice for themselves and their families. Some women make the decision to have a home birth because they feel that it is the best choice for their health. When we dismiss baking homemade bread--as Amy Tuteur does--as a "delight" indulged in by privileged women with nothing better to do, we ignore the reasons that those women choose to indulge in that delight. In short, we dichotomize that argument as well. This, of course, does not just extend to bread, but to healthy food alternatives in general. And when we trivialize those decisions, we also trivialize those reasons, dismissing that the benefits derived from a such a decision should be options for everyone. Which takes me back to my original post. I never said that women with less privilege should seek out home births. I said that "when we turn the debate into HOME="NATURAL" HOSPITAL=MEDICATED and then focus all our energy on deciding who is "right" in that debate, we lose sight of (in my opinion) the real goal: getting ALL women, regardless of their socioeconomic status and regardless of where they give birth, autonomy over their bodies, access to information, and the right to birth without fear and coercion." So if we decide that the concerns that would motivate someone to bake homemade bread are just privileged trivialities, it becomes easier to ignore calls for changes in our food policy that would make healthier food available to everyone, and I don't just mean by telling people to emulate those baking bread at home. I mean by regulating ingredients used in packaged food, by having clearer labeling policies, and by making healthier packaged options more affordable. In the same way, dismissing home birth as a fantastical "affectation" that only the ridiculous and privileged would choose ignores the reasons that those women are making those choices in the first place: to avoid invasive and often unnecessary interventions, to maintain agency during their births, to have a more private experience, etc. When we do that, we make it less likely that we will enact policies that would allow more autonomy and fewer interventions in hospital births. And that hurts all of us. And that was my point. You seems to have missed the point of my analogy. The issue is not whether those who bake their own bread have good reasons for it. The issue is why those who bake their own bread look at others who don't and announce that if only they were more "educated" and had more "access" to Whole Foods flour, they would do it. Only someone steeped in privilege could assert that what's keeping the non-bakers from baking is lack of Whole Foods flour. Similarly, only someone who is steeped in privilege could assert that what's keeping women of color or poor women from choosing homebirth is lack of "education" and lack of access to homebirth midwives. It seems never to have occurred to you that maybe women of color and poor women are right and you are wrong. And that's what racism and classism are all about, assuming that because you are white and well off, everyone surely ought to want what you want. I didn't "miss" your point. I am making a different one. I agree that it would be the height of privileged arrogance to say that everyone should want what I want. But that's not what I said. I said that dismissing the reasons people make these decisions as trivial dichotomizes the conversation in a way that makes us ignore each other's points of view and thus misses the opportunity for joint advocacy, be it by increasing the affordability of healthy foods or allowing for more autonomy in hospital births. Once again it seems not to have occurred to you that women of color or economically disadvantaged women might not be particularly intersted in more authomy in hospital birth. You are sure that if privileged white women want something, every other women must want it, too. The overwhemling majority of women in this country don't care about autonomy in hospital birth. They care about a healthy baby and a healthy mother. You don't seem to consider the possibility that they are far more educated about the reality of childbirth than you are. And it seems not to have occurred to you that autonomy and birth experience might be a concern for all women. I'm advocating for more nuance and a more open dialogue to find that out. And, since you made this personal by claiming I'm trying to make women want what I personally want, I'd like to point out I don't want (nor did I have) a home birth. I am simply able to listen to viewpoints different from mine and see value in them. And I want to hear more, from voices that are often silenced in our culture. You won't even admit the possibility that they are right and you are wrong. You cannot even imagine that they are perfectly happy with their own choices and don't need you to "educate" them. I find it interesting that you make veiled insinuations that the author is actually a racist or a classist, when you yourself are making assumptions about a group of people based upon their skin color or their economic standing. That's because I don't see these women as a "them." I see these women as individuals with worthwhile points of view who sometimes get marginalized because of the racism and classism in our culture. And if you are so convinced that cultural influences aren't causing health disparities in births, how do you explain that such a disproportionate number of black women who did birth at home did so unplanned. Or that women who had unplanned home births were less likely to have a high school diploma? Or that women of color and women from disadvantaged economic backgrounds are less likely to get prenatal care? Exploring birth options is part of that care, and I fail to see how trying to address issues of polarization and advocating for broader discussion to address these disparities isn't a worthwhile goal. If you see them as individuals, why don't you ask them, instead of presuming to speak for them? As it happens, the problems of neonatal and maternal mortality among women of color are multifactorial and lots of people are working very hard studying them. It seems quite clear, however, that one of the principle problems is lack of access to high tech medical interventions. The idea that what they need is to reject interventions in the interest of what you perceive as their "autonomy" is downright bizarre. You also seem never to have given thought to the fact that the NCB philosophy is hardly about "atuonomy." If it were, there would be lots of variations; instead it there's a script. It's transgressive, not autonomous. NCB and homebirth advocates are a little serlf-contained subculture that must be taught to it's members. It has nothing to do with nature; it's all about defiance and denial. You don't seem to realize that modern homebirth midwifery is about MIDWIVES and what's good (and profitable) for them. The definition of "natural childbirth" is incredibly elastic, encompassing as it does everything from blood pressure monitoring to chriopractic, neither or which is found in nature. "Natural childbirth" is simply anything a midwife can do. Thinkk about it for a moment. NCB is set up in direct opposition to obstetrics. If only a doctor can do it, it's not natural, and if a midwifer can do it (even if it involves technology) is is magically "natural." The whole argument about increasing the "education" and "access" of poor women to homebirth midwifery is a rather cynical attempt of homebirth midwives to gain access to the Medicaid fund. It has NOTHING to do with what is good for medically underserved women. In fact, in is almost certainly harmful to medically underserved women because homebirth midwives are grossly undereducated and grossly undertrained. They would not be considered midwives in any other first world country. NCB is a cultural construct. It is not based on scientific evidence; in fact it ignores scientific evidence. That's why you won't find many proponents among obstetricians, pediatrician, neonatologists or any other doctors, the people who ARE educated about childbirth. NCB is about brainwashing women into thinking that refusing medically appropriate safeguards is a way to exercise "atuonomy." You've bought into that subculture, and that's fine, but you ought to recognize it for what it is and stop pretending that those who haven't bought into need to be "educated" by white women who have. I did not blindly "buy into that subculture." I chose a hospital birth attended by an OB. I appreciated the perspectives I gained from alternative viewpoints and incorporated them into a holistic, personal decision. But it was a very hard fight and the dichotomy of those two views (which is my whole point) is too polarized. I am not the straw man you want me to be, and I never said that less privileged women would choose a home birth if only they knew better. Open, non-polarized dialogue (which you clearly don't want to have) addresses that by making sure that choices (on both sides and for all women) aren't hijacked by extremist rhetoric. You say why don't I ask them as individuals, but that's exactly what I am advocating. Nicely written! This is a really fascinating debate and I actually think the analogy between a home birth and baking bread is a good one. It highlights a lot of the issues of privilege and access that surround both.